Been pretty quiet on the hobby front this past week, but I got a little time in to start laying down the gold on the Emperor. I'm rubbish at the NMM technique, and figured this is not a model to experiment on so the ordinary metallic methods it will be! Started off my laying in a basecoat of Brassy Brass. 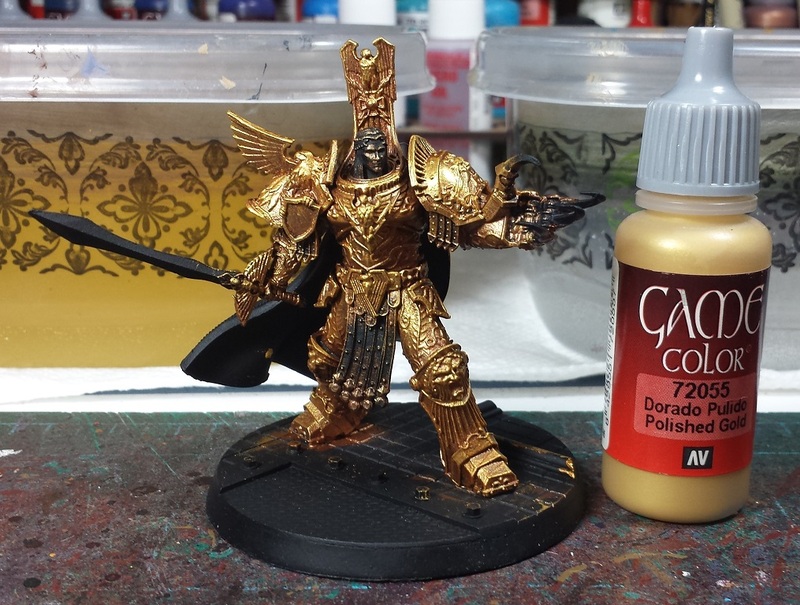 Generally speaking I find most gold paint to be rather translucent, and laying a gold in directly over a black basecoat tends to make for a dull lifeless color. The brass is a bit more opaque so covers over the black well, and will 'shine through' the gold making for a richer, more vibrant color. Glorious Gold was liberally drybrushed over the brass, leaving the deepest crevices to show the brass coloration. 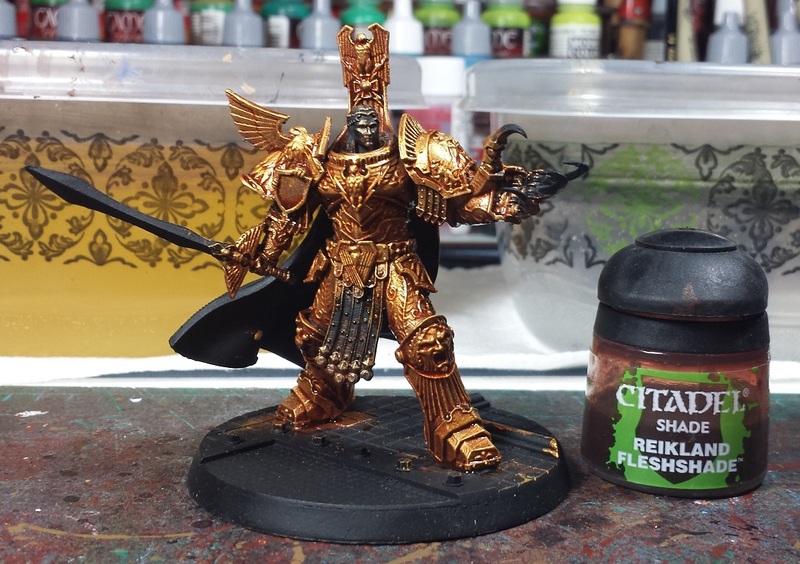 Next up the upper surfaces were given a light drybrush of Polished Gold, making sure to only draw the brush down the model from overhead, leaving the under surfaces in the previous gold color. Once that was done, the model was given an initial wash of Reikland Fleshshade. 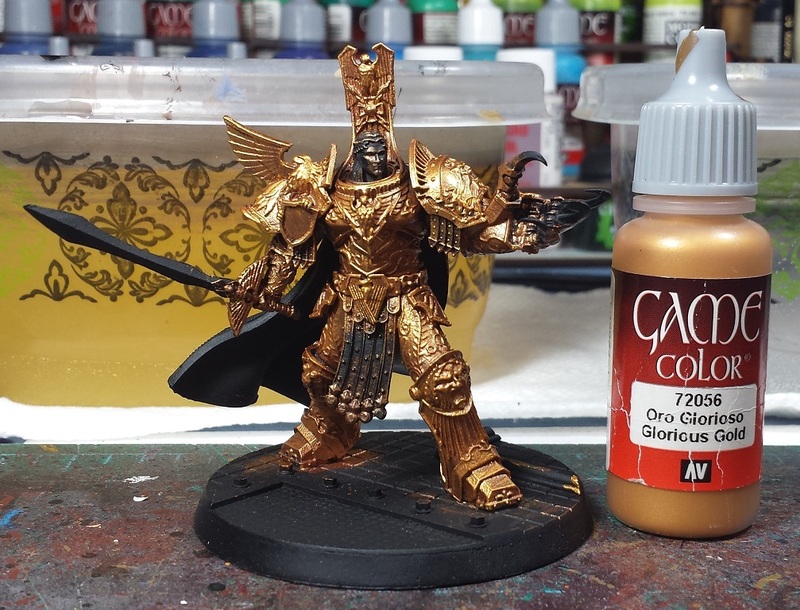 This helps add a rich reddish-gold tone, and helps define a lot of the details. At this point the model must be left alone for a good hour or so to properly dry (you can see it's still wet in this photograph), so further steps will have to wait until a later day. Next up comes the more painstaking part, going back in and with a fine detail brush start selectively highlighting the various details and scrollwork to brighten it back up again and help it 'pop', followed by a further selective pin washing. As far the model itself goes, still feeling the head is a little small, but overall I'm quite happy with the sculpt. Lots of neat little details that I'm catching now that I'm really looking at it up close! In other news I'm finally getting the Rogue Trader campaign I've been working on off the ground starting in a couple weeks, so there's a good chance there may be some more 40-themed RPG minis crossing the painting desk in the near future. The Geno Five-Two are down to the last handful of colors as well, holding off on pics until I can finish 'em up and lay out pics of the whole infantry group, though! Those two Vallejo golds work well. I love their brass and tin bits equivalents. I'll have to look into picking up some of these golds now. Also glad to see I'm not the only one that uses that wash for gold. Gives a great base tone. His head and sword were the weakest parts of the kit when I first saw him previewed but until FW get to him this version is still a great stand in. Oh my. That is a nice start :) I foresee you leveling up on this one... You're not getting all painterly on us now are you? That would slow you production to a crawl. Also, the NOCF is looking for folks to help out with painting armies and such this year again. You should contact Dave Talyor as there are some projects this year that would be right up your ally! Huzzah that's bright :) Now I know how mortal men feel when they look upon the Emperor in person! Good start to a fantastic miniature! I need to up the amount of effort I put into my gold it seems. He is looking rather spiffy. I agree with comments regarding the head and the sword. Indeed replacing the head with a suitable helm leaves him as a cool stand in for a number of primarchs or even the missing two. Either way it will be interesting to see how he comes together for you. It s a third party conversion head cast. Or the Sternguard kit has several characterful bare heads, or perhaps a Blood Angel head as they have hair? Looks really good mate, I love that recipe for gold! That’s a lot of layers. Works really nicely though as the end result is very rich. Do you also highlight with a little silver here and there? I'm with Siph Horridus; the emperor is a pin head.... The rest of it is fantastic and I'm loving your treatment so far. @Frothing Muppet: Aye, really think that this one will go up on the auction block, and I'll try a second run at it with a different head and perhaps a more ornate sword. @Zab: Haha! We'll see how it goes I suppose! I'll drop Dave a line and see if there's anything I can do to help out! @Musing of a Smurf: Thanks very much! @Rory Priest: I appreciate the kind words! @Siph_Horridus: I'm going to see if I can find a spare Primarch head, perhaps Horus and sculpt some hair on it! @RED SCORPS: Thanks very much, man! @Dai: Indeed! At the end the edges will get a little silver highlighting. I appreciate all the kind words, folks! 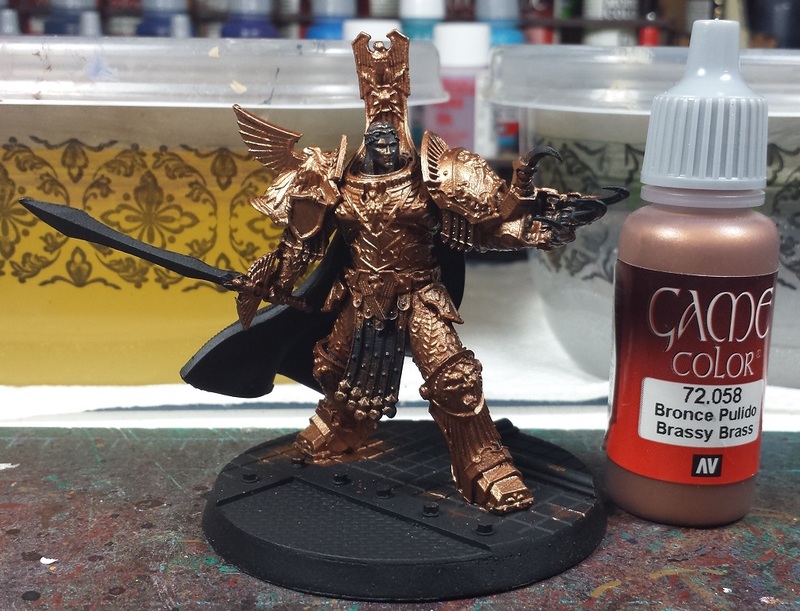 Once the flesh shade is thoroughly dry, it gets another super light drybrush of shining gold to bring up the edges, followed by a little silver on some of the uppermost edges. I just realized I never did the follow-up post on this model - More pics to come!